Hello Friends and welcome to the big Pinkfresh Studio release party! We're so excited that you're here. If you have just stumbled upon this hop, you can go here to start from the beginning. Or you can follow the handy link list I've included at the end of this post. If you're hopping with us already and you've arrived here from Heather's blog, you're in the right place. There is so much in store - heaps of very talented guest designers hopping on board this month, as well as gorgeous project ideas from the team, and some big giveaways! But first, you can see all of the amazing NEW goodies HERE! And before I get to allllll of that, I hope you will all take a teensy moment while on Lea's blog to wish her a Happy Birthday today!!! Lea is not only a remarkable artist, but the sweetest, kindest person and our fearless and spectacular team leader! Lea - I hope your Birthday is filled with happiness, joy and so much love! For my cards today I wanted to try something fun! Have you noticed that all of the Pinkfresh Studio sets have a delightful (and helpful) graphic on the back? 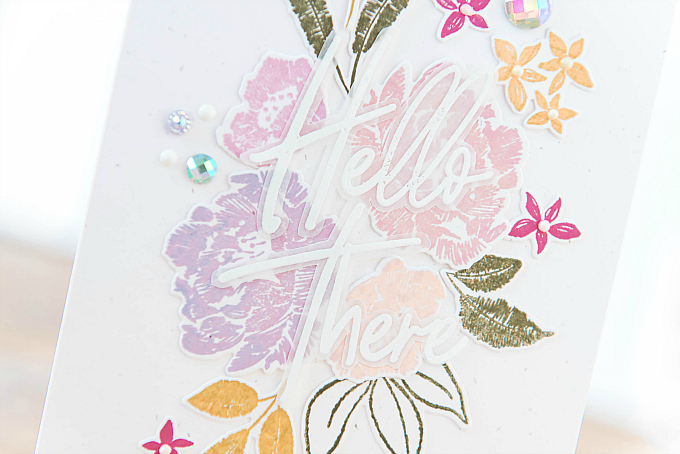 I thought the beautiful Embroidered Blossoms stamp set would be just the perfect set to try these pretty design guides, as there are soooo many beautiful bitty bits and upon opening the dies and stamps, I needed just a minute to figure out which goes with which. But using the helpful graphic on the back made the whole thing a breeze! I started out by stamping a pile of flowers and leaves, following each floral cluster design shown on the back. I did my best to match up the inks, so it would be easy for me to tell each bit apart. I then matched the dies with the stamped designs, and ran the whole stamped cardstock through my die-cutting machine. Before I knew it, I had a pile of pretties to use! I was able to make four beautiful and easy cards using the bundle of cuts. Aren't these florals stunning? I simply can't get enough of them. For each card, I partly used the guide on the back of the stamps, but also sort of did my own thing, adding to the designs. And I'm now super familiar with all the shapes so I can make new blooms in no time. If you struggle with figuring out new stamp and die sets, this is a fabulous way to get acquainted with all of your newly added goodies. 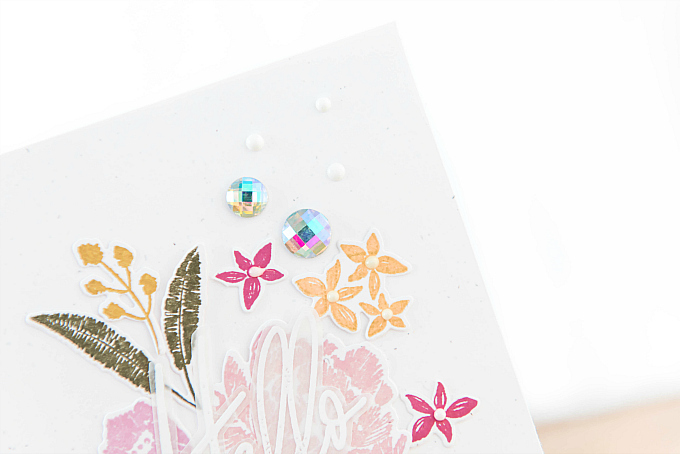 For all the cards I used the beautiful Embroidered Blossoms stamp and die set. and for the sentiments I used the gorgeous Scripted Bold Sentiments 1 and Scripted Bold Sentiments 2 stamp sets. I think these are the prettiest sentiment stamps I've ever inked up. These two sets pair so perfectly with the Embroidered Blossoms designs. 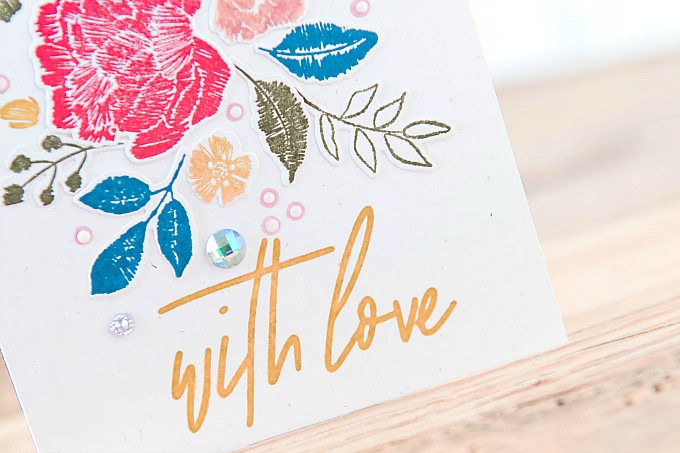 I feel this gorgeous font gives the stitched florals such a modern twist, what do you think? I also added a few Nuvo drops and some sparkly rhinestones to give the cards a bit of dimension. For my next card, I used a slightly different palette, also inspired by the back-of-stamp designs. I just love this color combo! It reminds me of fine French tapestries, and with the vellum sentiment, it becomes a much more ethereal look. I found that the Scripted Bold Sentiments stamped super well on vellum, and due to their size, they were a perfect candidate for fussy cutting. For my last card, I gathered all the leftover bits and added another sweet sentiment from the Scripted Bold Sentiments 2 set. I love that both of these stamp sets come with large fonts as well as bitty fonts. It makes for two very versatile additions. 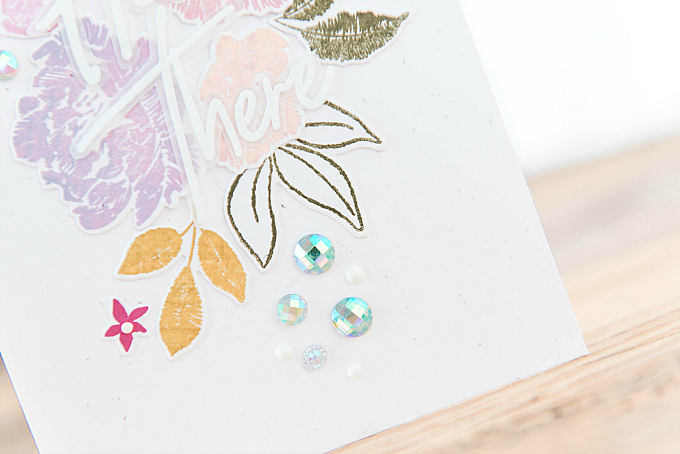 I also added a few little blooms from the Make a Wish stamp and die set. And just a dash of sparkle! I hope you will have just as much fun with these stamp sets as I did! Also I have a heap of cards still coming your way in the next couple of weeks, featuring a whole lotta more of this release! 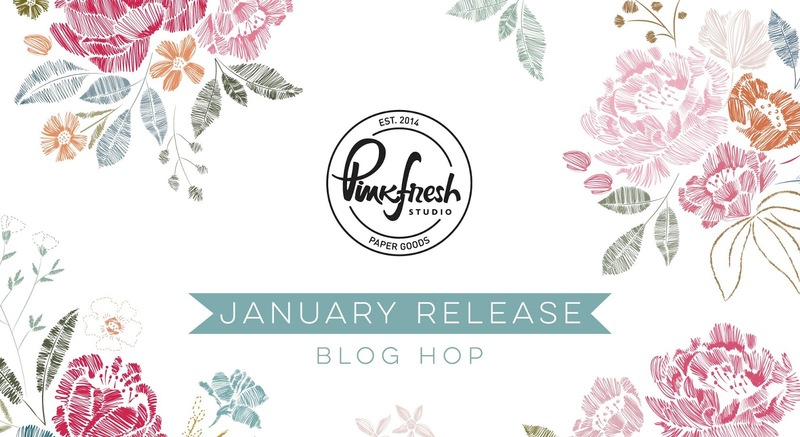 The ENTIRE January release is up for grabs on the Pinkfresh blog and Instagram feed! Head on over to each of those to check out all the details. PLUS Each blog on the hop will be giving away a $25 gift card! Simply leave a comment below and you are automatically entered. The winners will be posted on Sunday January 20th on the GIVEAWAY PAGE All winners must check this page and claim their prize within two weeks. This little Pinkfresh exclusive Dainty Love Balloon is ALL yours when you place your purchase of $25 or more. There is no code, it will simply be added to your cart. If you're continuing on, your next stop is the talented Jessica Frost Ballas! And here is a handy guide just in case you've lost your way. For your convenience, I've compiled a list featuring products used in the project(s) above. By using affiliate links when you shop, you will be helping to support this blog and exciting new content. Simply click below to go directly to the products, and in doing so, when you shop, I earn a small commission - at no extra cost to you :) Yay to a double win! Beautiful cards. I especially love the pastels. Such a lovely stamp. TFS! Beautiful cards! 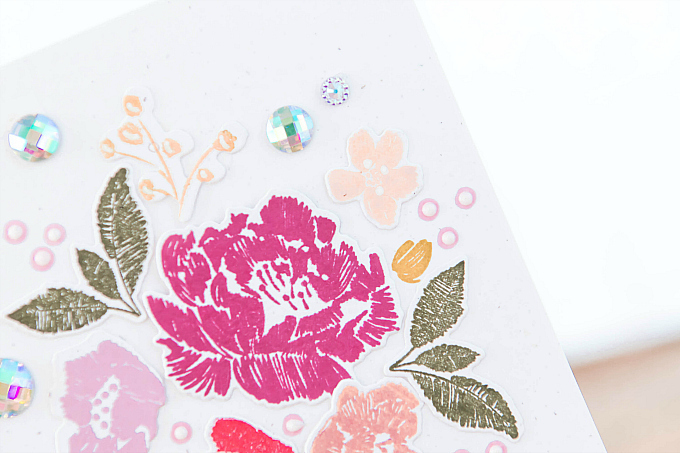 I love the versatility of the embroidered blossoms stamp set. Pretty colors and tips for using new “toys”! 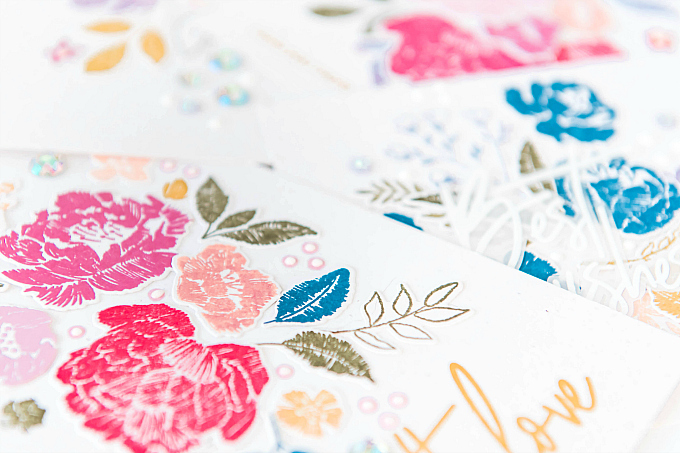 What a beautiful set you've created with those pretty new stamps!! I love those Scripted Bold Sentiments! How pretty all those colorful flowers are! The flower colors and designs are so pretty Ivana. Always in for florals. Thanks for the great inspiration! Ivana, your cards are stunningly beautiful! 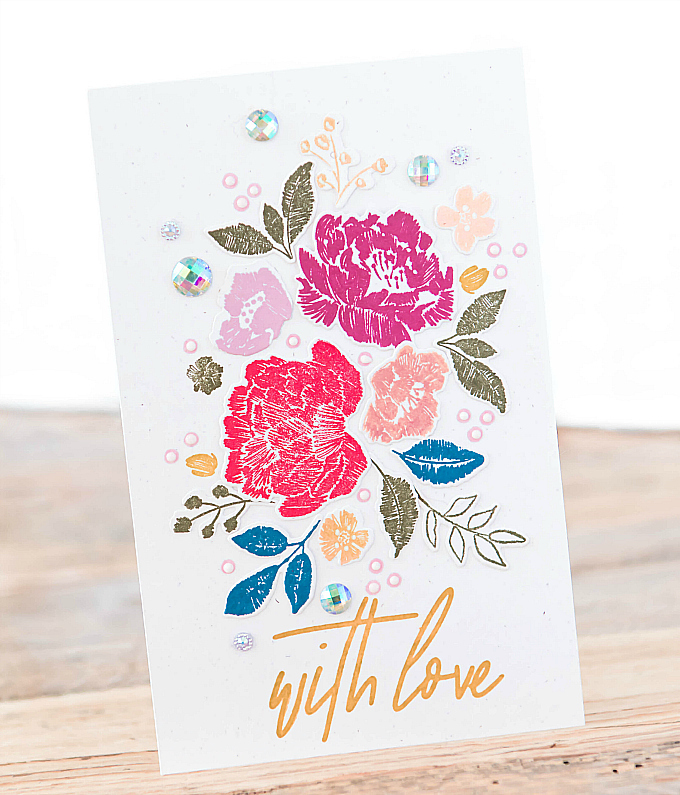 What beautiful cards; those pretty colors bring hope of spring! So pretty and feminine. Love the colors you used. Gorgeous bouquets! The first one actually looks hand embroidered with the way you have placed the flowers! lovely cards - these new release is AWESOME!! Love the vellum sentiments. they tie up the cards beautifully. So very well done-! Ivana, these are just gorgeous! 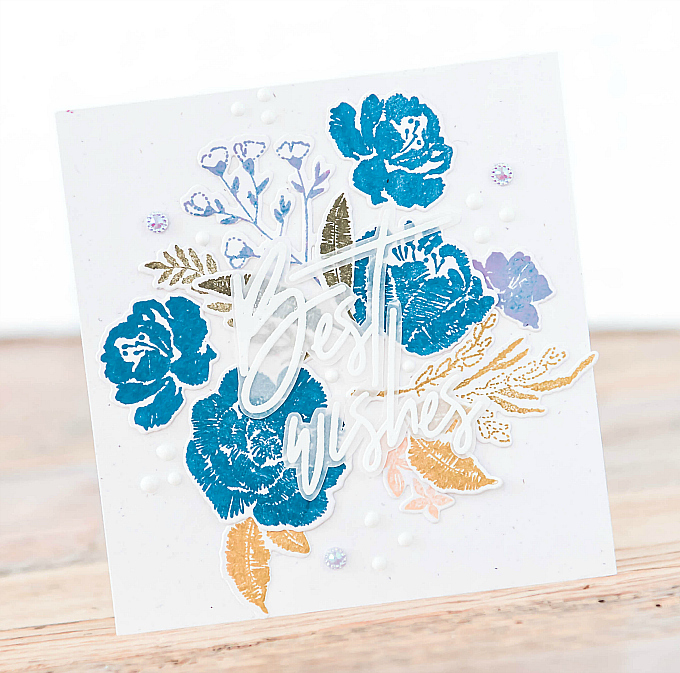 I have to agree with you that the new sentiments release is one of the most beautiful I've seen. 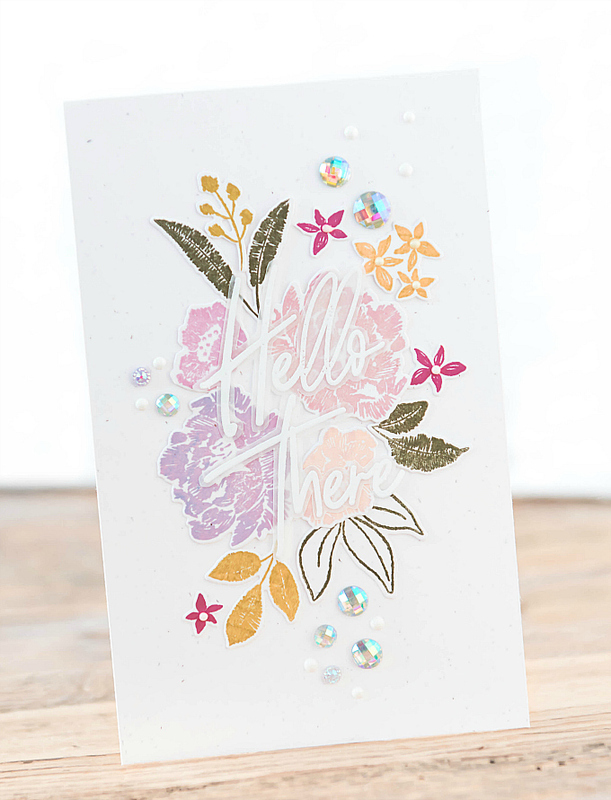 I am new to card making and this is my first Pinkfresh Studio blog. I am SO happy it led me to your website. You have such wonderful creations. These cards are so beautiful and inspirational. Thank you for sharing! Beautiful cards, the colors are just stunning! These cards are so beautiful - love each one of them!! You should be a florist! You know how to arrange flowers on cards BEAUTIFULLY! Wonderful! love the great cards made by this new release. hanks for sharing the release ideas. Beautiful cards. I love this wonderful release. Simply beautiful cards, ALL of them! Gorgeous! I love all of those clusters of colorful blooms!!! So happy and fun! The florals are gorgeous! I love all your finishing touches on these cards. What a lovely display of feminine cards! Those embroidered blooms are ever so pretty. They look wonderful in the soft colors you've used. These are all so dreamy! These are gorgeous! Love the color combos you selected. The floral with the vellum and the big scrip! So so pretty! Your cards are just dreamy! 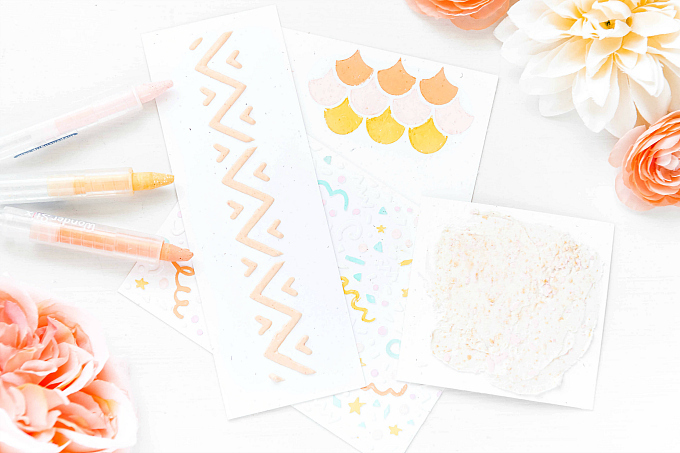 I'm in love with that embroidered stamp set for sure! I love all those beautiful florals you created! My favorite card is the one in blue. Thanks for sharing! 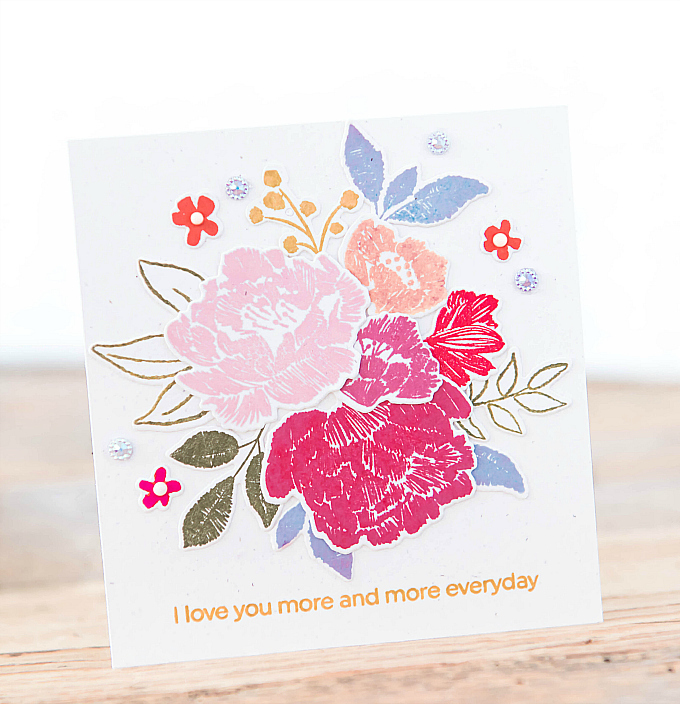 Love the cards you created with the Embroidered Blossoms set! Lovely! Beautiful!!! 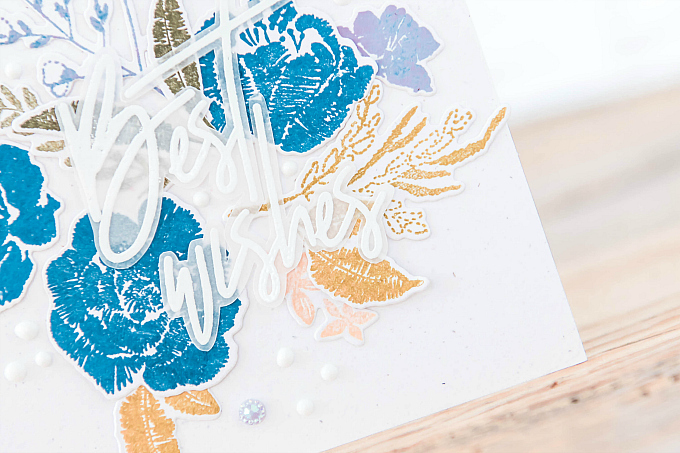 Lovely cards - such pretty layouts and I love your color choices. 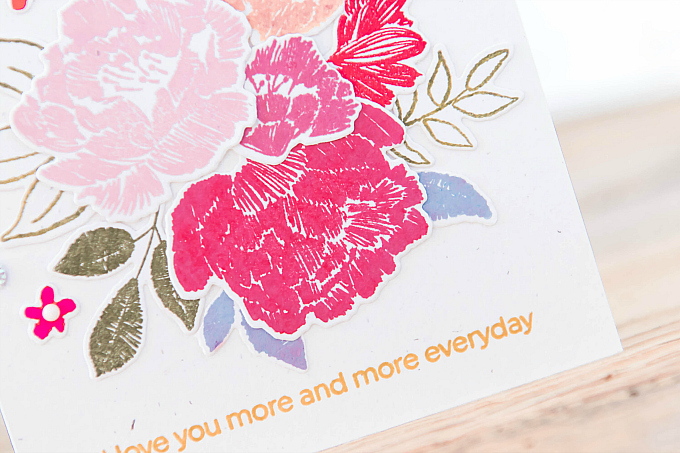 All of your flowers and leaves and all so beautifully stamped! You have such a lovely color and composition in all f your cards that they are super easy to love! Super fun cards. Love all the different looks you got with the floral set. What beauties you have created!!!! A stamp set that makes your cards look like you have spent hours hand embroidering! Can there be anything better? I absolutely love this set. And the inspiration cards are fabulous. You are right! These florals are gorgeous!! They are even better when paired with these wonderful sentiments in the new fantastic fonts!! Great job!!! Beautiful!! And the new release looks amazing! 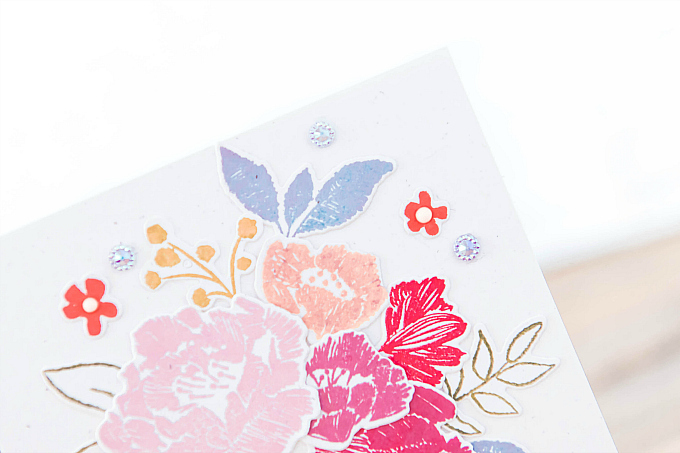 Loving the florals and these cards! OH...... such beautiful color/floral combinations. Love every perfect detail! Your cards are very pretty. Very delicate colors to show off beautiful new stamps. You did a wonderful job. Thank you for the inspiration. What a great idea to use the packaging as inspiration for your card designs! Love how they turned out, so gorgeous! Gorgeous cards and I love the colors of your flowers! The scripty fonts are so beautiful on your cards. Love them all! This set has so many pretty flowers! Great idea to just stamp them all and make a few cards. They all turned out lovely! This set of cards is just lovely! I am curious how you did the very intricate cutting for the vellum stamped pieces! I kept looking for the coordinating die set but then I realized you embossed! Beautiful collection of cards, I am totally in love with that scripty font, too - makes any design look so elegant and sophisticated! Beautiful cards! The embroidered effect is fantastic. 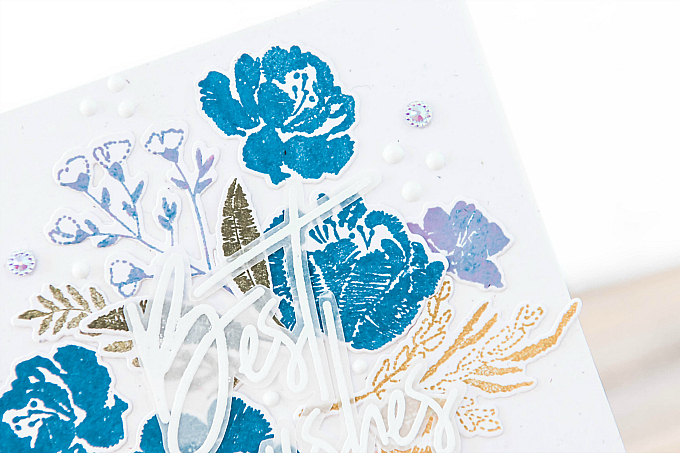 The embroidered blossoms is my favorite it would be great for layouts using them just as you have on the card, can't wait to get them! Very pretty! This set really does look embroidered-especially the leaves. WOW! what an amazing set of cards!! Looks like printables!! Beautiful, I love that stamp set too, little bit folk and little bit oldy-worldy. your cards are stunning and so beautiful! These are such pretty florals! Love the vintage feel of these cards! So pretty. Love the embroidered look. I love that blue you used on the Best Wishes card! This is my favorite set from the new release and I just love how you created with it! Beautiful cards! The florals are, indeed, stunning & your creations are stunning also! Love them all! The embroidered flowers look so awesome ! Thank you for your wonderful cards ! Beautiful job turning all of the pretty bitties into gorgeous card! Your cards are beautiful, I love how you got so many looks from one stamp set! I agree - the new Scripted Bold Sentiments are GORGEOUS, no doubt at the top of my "must have" list. Thanks for sharing all your cards and I look forward to seeing what else you create with the amazing release! 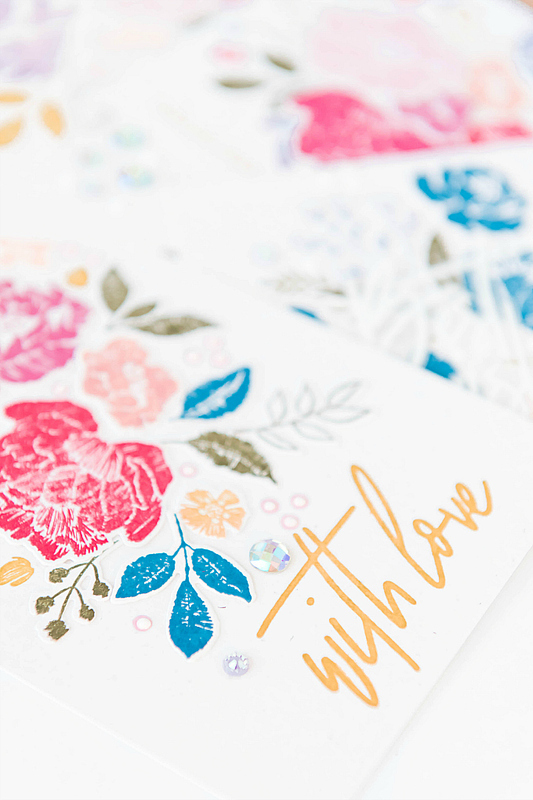 So many pretty florals on these lovely cards. Thanks for sharing this inspiration with these fun products. These are gorgeous! I love the sentiments and floral arrangements!